Liverpool boss Gerard Houllier has told out-of-sorts striker Emile Heskey his future at the club is safe. The 25-year-old attracted criticism last season after he netted only nine goals in 51 appearances for Liverpool. Now, Houllier is backing his £11m-striker to bounce back to form when Liverpool kick off their Premiership campaign against Chelsea on 16 August. "I've recently spoken with Gerard Houllier and he's assured me on my future at the club," Heskey told the club's official website. "I was often unlucky last season. I think it was a poor year but I've never lost hope and I want to rediscover my form for next season." Heskey, who arrived at Anfield in 2000, has responded to Houllier's support by pledging his future to Liverpool. The striker, who found himself pushed out of England's starting line-up in favour of Wayne Rooney, had been linked with a move to French side Lyon in order to raise transfer funds for Houllier. The French boss has joined the chase for Leeds striker Harry Kewell and is also keen on Blackburn winger Damien Duff. 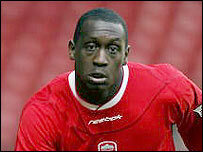 But Houllier is now determined to keep faith with Heskey, who is contracted to Liverpool until 2005.